First up, gears – we looked at identifying shifting problems, straightening hangers, replacing cables, adjusting mech stops (front and rear), setting cable tension, barrel adjusters for fine tuning. Then we moved onto headsets – identifying problems, adjusting to reduce play, stripping. servicing, and replacing. Once the headset is sorted and any play removed, then usually any further looseness in the front end is likely to come from the forks, so we tackled a full fork strip down and service next. Replacing cables and tuning gears! 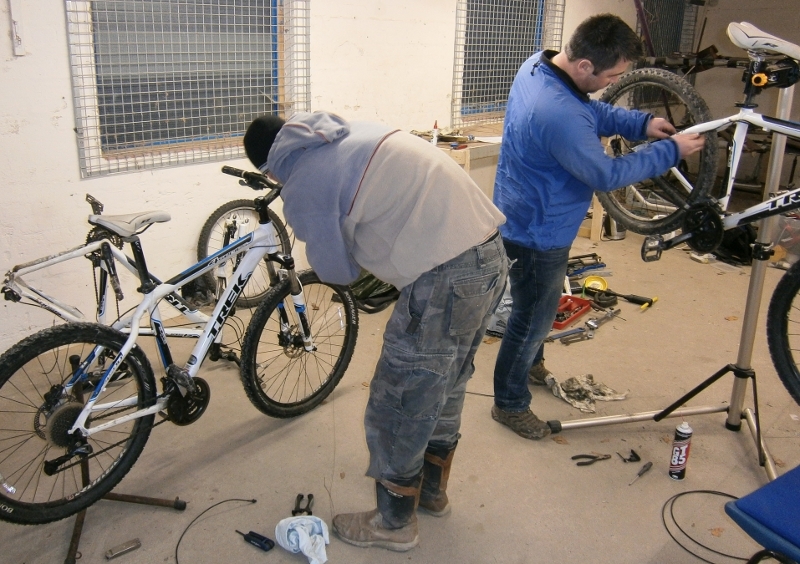 After forks, we moved onto brakes – looking at different types, and different bleed methods. Finally, as it began to get dark outside, we went through the process of bottom bracket replacement, looking at issues with different axle lengths, bottom bracket shell sizes, and variations in the designs of chainsets and how these might affect BB choice. All in all, a good and very busy day, with lots of great learning outcomes for all. Oh, and the chips from Bala chippy were top quality too!